Freezer paper and Hamburger patty paper are both available from One Stop Jerky Shop. Purchase the freezer paper or locker paper in large rolls which are perfect for wrapping many deer or buy it in smaller amounts. 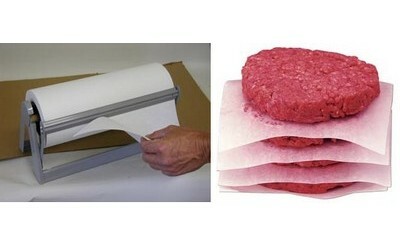 Hamburger patty paper keeps your burgers from sticking and can also be used between your steaks. The tape is specially formulated for better adhesion in low temperatures. Perfect for securing freezer paper. You get 4 rolls of tape. 11-02023/4" wide X 4 3/8" in diameter with a center hole that is 3" in diameter.44 yards per roll for 176 total yards of tape.Check out our [product_id=429]Freezer T.. This freezer tape dispenser is indispensable when packing foods for the freezer! With its weighted non-slip base you won't have to chase your tape around the table anymore. 11-0201Weighted, no-slip rubber base2 piece spool fits 3" or 1" core tapesIncludes one roll of freezer tape - 3/4" x 44 yardsAd..
Weston heavy duty freezer paper is designed to protect meat from freezer burn and bacteria while in storage. A sanitary poly-coating provides the best protection for meat and prevents the paper from sticking to the meat while freezing or thawing. Great for large or small game and convenient to take ..